1. I'm moving my blog to my site! Sorry for the radio silence but I've been busy getting a new website ready … and at last I can let you know…it's here! 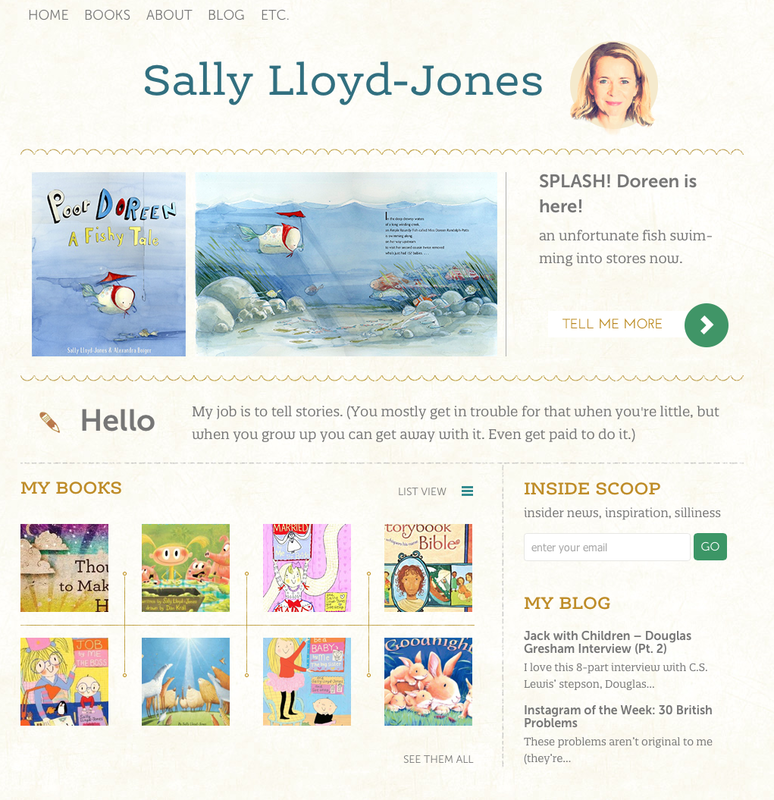 Sally's Blog will take you right there. 2. GIVE-AWAY: “POOR DOREEN” - CHANCE TO WIN MY NEW BOOK! CAUTION: A fish named Doreen has taken over my twitter feed… and now my blog! I cannot be held responsible for anything. In celebration of POOR DOREEN (swimming into stores in March) I’m doing a fantabulous giveaway! But before we get to the giveaway, introductions are in order. 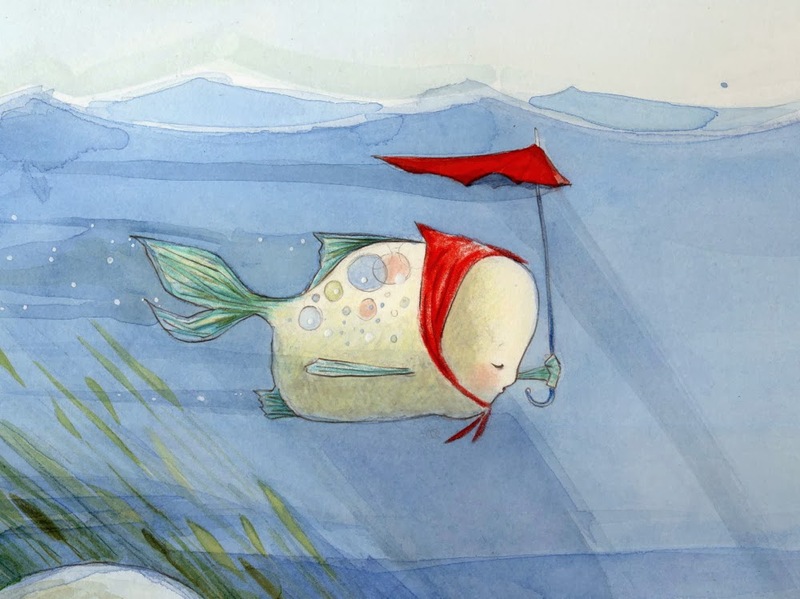 Meet Poor Doreen, the fish star of my new picture book. Actually. Sorry. Her full name is Mrs Doreen Randolph-Potts. Ever heard of a fish with such a name? Neither had I. And she is quite unusual. Have you ever seen a fish in a headscarf? With an umbrella? Me neither. Nevertheless here she is. And entrants will be featured in future blogs too! Don’t miss the chance to have your fish portrait shown in a glorious fish gallery. I can’t wait to hear from you, and to share more about POOR DOREEN in coming weeks. A friend sent me this. So well done. And so true. The film makers asked some children to pretend to be a salesman and a customer. If you’re comfortable, you’re doing it wrong. The last 20 seconds are the most important: when you want to stop—keep going because that’s when you get stronger. What other Spin-Spirations have you heard? First broadcast on BBC Panorama on 1st April 1957, a very young Richard Dimbleby revealed the wonderful world of Swiss spaghetti production to millions of deprived and hungry post-war Brits. Most of Britain were taken in. Even my dad - who is usually brilliant and smart - even the likes of he, totally fell for this gigantic April Fool's joke! Which just goes to show, if you have a serious and very important enough voice, you can hoodwink anyone. What an inspiration to us all. Ballet dancers can make floating in the air look easy, make balancing en pointe look effortless. But the only reason they only can do that is because they have spent hours and hours training, putting their body through torture. They can do it only through sacrifice and suffering. Behind all that ease lies hard work. Maybe tears. Certainly pain. Mastery it seems to me is making something incredibly hard look incredibly easy. Mastery hides the craft and the skill and the hours and hours that went into making it look that easy, so that all you see is the grace and the ease. It's also true of writing. One thing I know about picture books is: if it looks easy, you’ve probably done your job. (Is that why so many people think anyone can write one?) If someone looks at your picture book and says: “WOW! That must have been SO HARD!” you've missed it. It should look easy. It should look as if anyone could do it. In fact, if it looks like you worked on it, you probably need to work on it some more. Years and years on a short picture book text? Here’s a great clip from Jerry Seinfeld on how to write a joke. This one took him 2 years. Two years on a joke? Yup. Working on this joke Seinfeld compares to writing a song. He could just as well have been talking about writing a picture book. It takes hard work—to be simple. It takes longer—to be concise. Short is not the same as quick. Today is St David's Day. So... Dydd Gwyl Dewi hapus! St David (seen here in a stained glass window from Jesus College, Oxford) is the Patron Saint of Wales. In the 6th century he helped spread Christianity among pagan Celtic tribes of western Britain and he only ate watercress and once stood in the middle of a lake up to his neck--but I don't remember why. He is famous for saying, "Gwnewch y pethau bychain" ("do the little things") but then proceeded to be canonized and do great big things. But then again, even the greatest of all journeys is made up of small steps. So, in honor of St David and his Day, why not do the little things today... take the next step... do the next thing. Hooray for St David's Day! And Hooray for little things! The Blizzard came and transformed the city. Before the snow ploughs and the footprints and the salt and the dirt could arrive, I got up early to capture it. I stepped out of my apartment—and into Narnia. Complete with lampposts. Everywhere, everything was brimming with light. Beauty that catches in your throat. Sudden brightness—shining in the air, in the trees, in the skies, at your feet. Every moment a new landscape. The early pink skies and the gentle light on the snow cushions on benches. The afternoon sunlight that turns trees to crystal, and a park into an enchanted forest. Snow making everything beautiful. Covering over the ugliness, making everything look new. Almost as if the world has been made again and we are coming upon it for the first time. Is it the world—or our eyes, that are made new? Children’s eyes are new. They can see what we have become blind to. I would like to live every day with the eyes of a child. I would like to unlearn what I’ve learned. I would like to step out of my apartment every day with new eyes to see what is always all around me, shining at my feet. The last 20 seconds are the most important: when you want to stop because you can’t go on—keep going because that’s when you get stronger. Dr David Martyn Lloyd-Jones (1899-1981) is the rock star of theologians, writers, thinkers (seen here wondrously on a horse). And I'm a total groupie. I wish I could say I’d met him. Or heard him preach. Or had him as my great Uncle. Sometimes I even wish (inappropriately) I could tell lies: "Ah yes! He used to dandle me on his knee of an evening. How well I remember him singing Welsh hymns to me! Oh yes—and the time he took me riding on his horse!" Which for some reason I always follow with "sorry." I feel it is such a let down. I'm rather let down by the whole thing myself. But I'm pleased when people ask me if I’m related—because it means I've found another fan of DML-J's teaching and sermons and books—and (if they're not too disappointed) probably a new friend, too. If you haven't heard of him, then I'm happy to introduce you... Meet THE Doctor David Martyn Lloyd-Jones. In fact, I snuck him into my new book "Thoughts To Make Your Heart Sing". One of the things I loved best about writing this book was that I got to share some of my MOST favorite writers and thinkers. Here's one entry (inspired by the good Doctor’s great book, "Spiritual Depression". With the start of the new year, we are all turning over new leaves. But are you turning over a new tea leaf? Is your tea flavorless? Insipid? Bitter? Ordinary? Or worse… Cheesy? Here, just in time, come the six golden tips for making the perfect cup of tea. Think you know all about everything already? Did you know this golden rule: never, ever EVER store tea near cheese. Follow these tea tips and then your year will be off to a good start! When you walk through Central Park you feel like you've have escaped out of the city into the countryside—you are surrounded by natural beauty. The natural beauty of Central Park is completely designed—to seem as if it wasn't. When the park was built, back in the 1850s, only wealthy New Yorkers could afford to go the Adirondaks. The designers, Frederick Law Olmsted and Calvert Vaux, wanted to give those who couldn’t afford to go, the experience of being in the Adirondacks, the same experience of beauty. Central Park is a park designed for everyone. Joshua Cohen wrote of two examples of the designer’s obsessive attention to detail. First, the park is 2 ½ miles long. The Central Park Commission said that there had to be four cross-streets connecting the east and west sides of Manhattan. To do that and still feel as if you’re in the Adirondacks, Olmsted and Vaux put the cross-streets eight feet below—an innovation in park design. “Second,… in … the Bethesda Terrace there’s a fantastic ceiling made with more than 15000 tiles. They’re encaustic tiles which means that the color and geometric design on the surface goes all they way through: it is not a glaze but multi-coloured clay. The ceiling was designed by British architect, Jacob Wrey Mould, based on his two-year-long study of the Alhambra. So this public park in New York City includes a structure with a ceiling based on one of the most beautiful works of architecture in the world." I’m so grateful that Frederick Law Olmsted and Calvert Vaux believed everything matters, that they went for excellence—down to the tiniest, most obsessive detail. And, as a result, gave us Central Park. Excellence, it turns out, is not elitist. Excellence is the most inclusive thing. It is beauty and beauty reaches everyone. It's a bit like books that way. At least picture books. The best ones are completely designed to seem as if they aren't. Truly great design is almost invisible, I think. It's there not to draw attention to itself—it’s there to not get in the way of the story, the experience, the beauty. Great art is a generosity. Because it's not about the creator or the designer—it's about the person looking at the painting, the reader opening the book, the New Yorker walking across the park. PS: One last fact about Central Park you may not know. I didn't. It took more gunpowder to build Central Park than was used by both sides in the battle of Gettysburg. One December, I found myself looking back over the year wondering, unhelpfully, in a businessy tax-ish counting sort of way: "Now let's see, what exactly did I do this year?" (I should have known by that "exactly" where this would go). So I began counting up the number of picture book manuscripts I'd done that year—in a kind of awful picture book accounting. It wasn't long before I realized there were none. I'd written no picture book manuscripts. I hadn't got a single picture book contract that year and no picture book published. How could this have happened? I'd been working so hard. What had I been doing all that time? The trouble was I was looking at picture books like an accountant—as if they were products you manufacture. But picture books aren't products you manufacture; they are seeds that you sow. You can't force a picture book—any more than you can a seed. They need time to take root. To grow. You have to wait for them. You can't make them come by force of will power. They come when they are ready. Like plants. You have to work hard: get down on your hands and knees in the dirt. You must till the soil, water and weed. One year, none will come up. The next, they may all come up at once. So when you can't see anything and think you've got nothing to show--it's probably not that nothing is happening. It's probably just that what's happening is quiet, and hidden and secret. It has a lot to do with trust. And a lot to do with waiting. And a lot to do with being on your knees. And almost nothing to do with accounting. If you'd told me a couple of years ago, I'd be appearing in a big cathedral with a full orchestra and choir and with a former Miss World—I’d have laughed. Don't be silly. I never would have beleived you. But then again, if you'd told me I'd be "Playing the Ryman" I wouldn't have beleived that either. I'm learning what I expect or think or imagine is beside the point - and usually way too small. So anyway, there I was, that Sunday morning last December, driving to The Crystal Catherdral to be interviewed by Bobby Schuller about my new book "Thoughts To Make Your Heart Sing" - in two services that are broadcast to millions. I was driving along when suddenly I had to pull over. There, smiling out at me from the side of the road was a face in lights - a face I knew - me smiling back at me. Obviously I had to stop and take a photo. Next I parked in the campus. Took some more photos. And then I met the friendliest, most generous people, who welcomed me and fed me and prayed for me. I had make up and hair done, trotted up some steps in between some pastors and out into the cathedral - and the service. It was wild. It was nothing I ever expected. And it was a total blast. I can't wait to go back! Wow ... how exciting! You were so well-spoken in front of everyone! What an amazing opportunity!